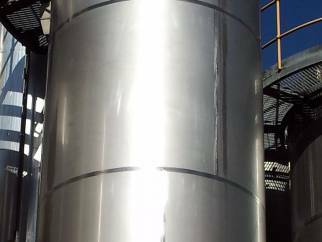 30,000 litre stainless steel vertical jacketed tank. Used 30000 litre vertical 304L stainless steel jacketed vessel manufactured by Bibby of Halifax. Inside diameter 2354mm x 7000 mm straight side, cone top and bottom. supported on 4 lugs on bottom of cylindrical side. Vessel design pressure atmos design temperature 60 deg.C, jacket design pressure 4.4 bar design temperature 70 deg.C.